Synopsis: Joey is worried his mother prefers his siblings over him. 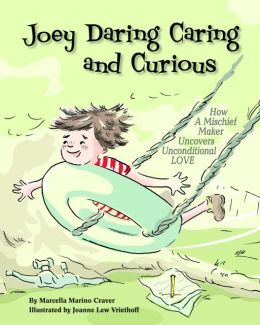 After all, Joey is daring, curious and mischievous. He just can’t seem to stay out of trouble, unlike his older brother and younger sister. He wonders if his mother has a favorite child and if there is anything about him for his mother to love. He gather his courage and writes a series of hand-written notes to his mom that will put a smile on your face. The author tackles a classic and worrisome question for children with humor, imagination and reassurance. Does my mother favor my brother or sister over me? Am I good enough? Does she love me as much as she does them? Especially if you are Joey and make a lot of messes, break toys, paint the walls, cut the dog’s hair and test your mother’s patience. It subtly emphasizes that breaking rules and independence are an important part of a child’s development. Parents will find this book serves as a great tool to discuss the meaning of unconditional love with their child. Joanne Lew-Vriethoff’s lively, expressive and whimsical illustrations are colorful and done in pen and ink. They perfectly capture the theme of the story. The cover is a great example. Resources: The one thing I like about books published by Magination Press is they have excellent resources and activities for parents and readers at the end. This book is no exception. Posted on March 13, 2015 by Patricia Tilton •	This entry was posted in Marcella Marino Craver, Perfect Picture Books, Unconditional Love and tagged Behavior, Family Relationships, Humor, Love. Bookmark the permalink. Great topic for a book! Any child with siblings will identify with this at some point. Another Magination Press winner! Yes, I do think most kids will identify with this book. Terrific selection, Pat! And a great message for kids. Thank you Robin. It it such a timely questions for young kids and parents. Magination Press always has books on unusual and important topics. Unconditional love: one of the necessecities and mysteries of life. Thanks. I’m glad you liked my choice. An important topic between child and parent. I must get to read to my two since they are so different. Good find, Pat. I’m glad you enjoyed my selection. When you have more than one child, it would be fun to have around. Think we all have gone through that period as kids. I think that until you have children of your own, you just don’t “get” this. But this book sounds like a great way to calm the uncertainties until you are old enough! Great point Wendy. It is a great way to calm uncertainties among anxious children. I love the cover and the idea of this book. I think all kids wonder if their parents love them as much as the siblings. I know I did. It is a soft and gentle cover, but one filled with energy. I think this is a universal question in among siblings. I think all kids worry about this. I have 4 sons, and I think all of them think they are my favorite. I love that. But of course, I have no favorites among them! They are all different but love each other and go places together, etc. I love telling this story–one year one voted for Gore, one for Bush, one for Nader, and one for Harry Browne, the Libertarian. A classic question for kids who rarely, if ever ask! Great recommendation, Pat! Love “Pen & Ink” illustrations, too! A rarity these days, it seems. Thanks Kim. Some kids ask and some don’t. It’s a great book to share with kids and open the discussion. Yes, the pen and ink illustrations are fun! Thank you! I’m sure it will spark great family discussions. Definitely a must-read for all kids! Funny enough, my kids never asked me this when they were little, but my 19 year old, just last month, thought I was coddling his younger brother more while he was sick than I did him when he was sick. 😀 I should have him read this book, too. The title is cool … and the whole concept of kids needing space to be adventurous and independent and daring and caring and curious and loved all the same. Kids need to explore their world, and know that it is ok to come home covered in mud after having gotten lost or falling in the creek. Yes, I think that it’s so important for kids to be adventurous and explore their world. And, know if they mess up, they are stilled loved. Sounds like a great book for siblings. I must remember this one! I get asked for PB recommendations. Yes, it is a wonderful book for siblings to read together. This is such an important concept for families that can impact a child for much of their lives. Thank you for selecting this book for your blog. I’m glad you enjoyed the book. It is a great topic for family discussion. Yes I agree, Erik. Glad you liked the book. This looks like a very sweet book! This looks like a great way to tell even the most mischievous ones that they are loved. Great choice for an important topic.